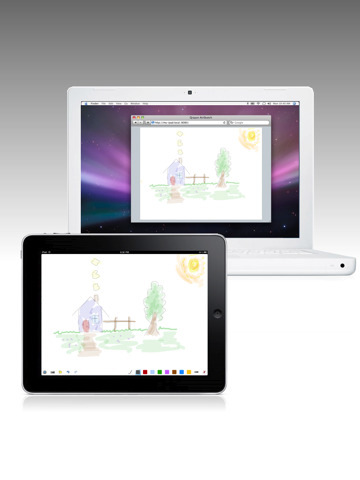 Sketch and annotate pictures wirelessly in your browser from your iPad in real time! The iPad is perfect for drawing and sketching, but it hasn’t been easy to record or share your work in real-time. Until now. Tip: You can also find the link in Desktop Safari’s Bonjour bookmarks: Show All Bookmarks menu -> Bonjour. Connect your laptop to a projector to present diagrams and sketch wirelessly to a big screen. Air Sketch is also perfect for recording videos of your drawings, sharing them with remote colleagues via online meeting or desktop sharing software (such as iChat), or incorporating the iPad into your desktop-based workflow. Note: Air Sketch is designed to work optimally with a single computer connected to the same local network as your iPad. ✔ Fast and fluid sketching on the iPad using your finger or 3rd party stylus (such as the Pogo Sketch). ✔ Real-time sketching to your browser: Strokes show up as you draw, network speeds permitting. ✔ Set the background image from any picture in your photo library, and project it wirelessly. ✔ 5 drawing tools: Pencil, pen, marker, brush, and highligher. ✔ A fully customizable color palette (tap on the selected color to edit it). ✔ Fluidly zoom and pan using 2 fingers to edit your sketches in minute detail. ✔ Instantly save and restore snapshots of your sketches using the camera tool. ✔ Email your sketches as PDF or images. ✔ Multi-level undo and redo. ✔ You can even use Air Sketch peer-to-peer with a computer via an ad-hoc network when a WiFi hotspot is unavailable (see our blog for the quick how-to). Air Sketch supports any HTML5-capable browser, including Safari, Firefox, Google Chrome, and even another iPad, iPhone, or iPod Touch! Please drop us a note (via App Support) and let us know how you are using Air Sketch. We’d love to hear from you and do consider all the feedback we receive for future releases. Want to present PDFs and pictures from your iPhone? Check out our sister App, Air Projector, now available in the App Store! Follow us on our blog or at twitter.com/qrayon to get the latest updates and be the first to hear about new releases. ✭✭✭✭✭ Please rate this app! Your 5-star ratings are super important, and help support the development of more free updates. – Tap erase once to erase the drawing layer, and tap again to erase the background image. – When setting a new background image, the previous remote sketch is erased only after editing the new one is complete. This prevents unnecessary blank screens on the remote display. – Pan and zoom using 2 fingers. Tip: Write in finer detail when zoomed in. The eraser size is relatively smaller when zoomed in. – Email your sketches as PDF or JPEG images.